The Illinois Central College Readers’ Theatre cast, along with the Peoria Ballet, ICC Vocal Jazz, Pulse of Peoria Drumline, Peoria Players Theatre, the family of former Peoria Mayor, Jim Maloof, and others will join forces and talents to raise money in a one-of-a-kind showcase of entertainment for the St. Jude Children’s Research Hospital Monday, April 18, from 6:30-8:30 p.m., at the Performing Arts Center on the ICC East Peoria Campus. 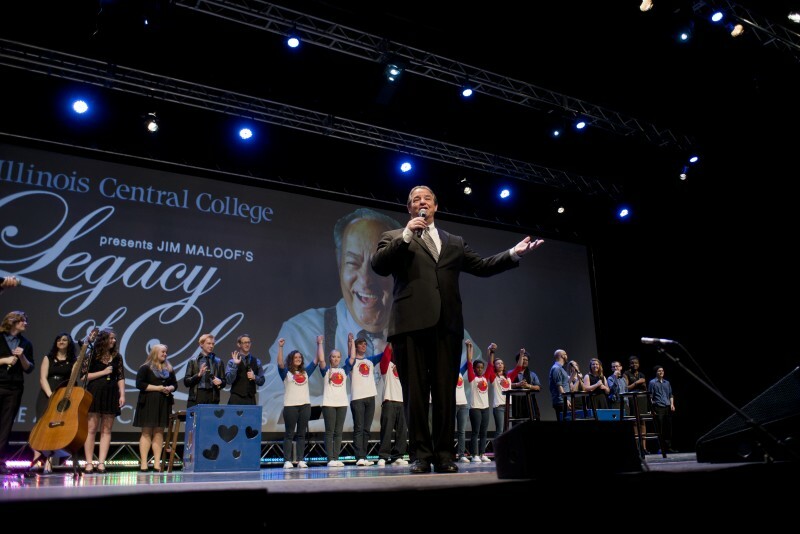 This one-night only event, “ICC Presents: Jim Maloof’s Legacy of Love for the Arts in Central Illinois,” is a family-friendly entertainment extravaganza designed to promote the performing arts in Central Illinois and highlight former Mayor Maloof’s local and national legacy with St. Jude Children’s Research Hospital. The event is free and open to the public, although tickets are required and limited to the first 500 people. Tickets may be reserved online at ArtsAtICC.com or through the ICC Box Office prior to the event. Due to the limited seating this year, ICC will also be live streaming the event via the College’s website, icc.edu/artsMaloof/ While this is a free community event, more than 50 ICC students—both past and present—will assist during intermission in collecting donations from the audience to benefit St. Jude Children’s Research Hospital. The evening’s itinerary includes professional dance sequences from the Peoria Ballet, an impressive knee-slapping performance by Pulse of Peoria Drumline, a selection from the Peoria Players Theatre upcoming musical production of “Hairspray,” sweet harmonies from ICC’s Vocal Jazz, an inspiring ICC Readers’ Theatre show centering on seizing the day and living for the moment, entitled, “Making it Count!”, and special performances by the Maloof Granddaughter Trio, Markie, Michy and Katie Maloof. The evening is sure to entertain audiences of all ages and will highlight Maloof’s involvement in both the Peoria area arts and in the founding of the St. Jude Peoria Affiliate. Former Mayor Jim Maloof passed away on January 19, 2013. Special guests include ICC Interim President, Bruce Budde, members of the Maloof family, and ardent supporters of St. Jude Children’s Research Hospital. A cookie and punch reception will be offered at the close of the program, and participating organizations will showcase upcoming and past performances through interactive displays located in the lobby.